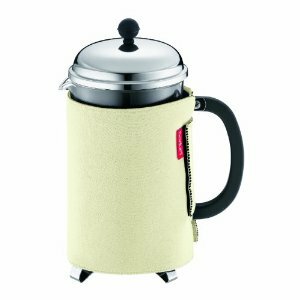 For all coffee lovers who like their coffee to remain piping hot, the Bodum Nero coffee coat for your 12 cup French press does the trick. Bodum, manufacturer of the original Chambord French Press Coffee Maker, introduces these perfect solutions to keep Bodum French pressed coffee at the perfect temperature and preserve the delicious taste. The Nero features insulating properties that conserve the heat within a Bodum Press. Whereas reheating coffee can lead to a bitter taste, hot longer, ensuring that the fresh, delicious coffee flavor is maintained. It is made of neoprene material and can be machine washed 30-degree C/85-degree F. The Nero is available in a variety of colors as well as a smaller 8 cup size and even a coat for your tea press.